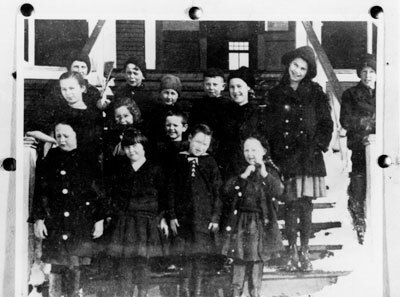 Class portrait of first class attending elementary school in Dundarave Hall (now the remodelled Presbyterian Church) Taken in 1915. People in photo: Back row from left: Bert Gisby, Philip Browning, Bruce Hay, W. Watt, Lauretta Bell, Kathleen Grady, and Arnold Garthorne. Centre row: Ina Garthorne, Freda Garthorne, John Allan. Front row: Helen Nightingale, Nettie Harmon, Edna Docksteader, Peggy Nightingale. Scanned August 2011 using Epson Perfection V700 Photo at 600dpi and 100% of original image size. Alternate Versions: Lossless TIF from original scan at 600dpi and 100% of original slide. W9 x H7 cm black & white print of original photo on photo paper.